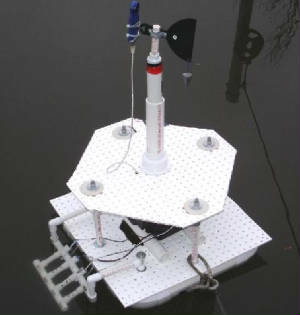 Observation systems are being deployed in all types of water bodies to monitor water quality. In the Chesapeake Bay, for example, nine buoys(seen to the right) are collecting, for example, weather information, water temperature, salinity, conductivity, dissolved oxygen, waves, currents, and tides. Doug Wilson, oceanographer with NOAA’s Chesapeake Bay Office manages this set of buoy. Well, as part of this program I was asked to develop a web page that allowed students to mine the data, graph it, and then analyze it. I went on line, started to do this and became completely bored with the prospect. If I was bored, the students would also be.. so I thought… “what if…” the students could build a buoy, calibrate and install sensors, and the data can be posted by students to a web site? What if… students from different areas of the Bay could look at the site and compare their data and experiences with students in other parts of the Bay? 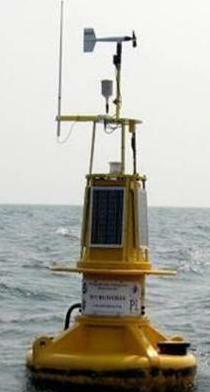 From this thought, the Basic Observation Buoy was conceived. I went into my shop and, first, built a BOB using a life-ring. This first iteration was unsuccessful. Off to the local hardware shop and out with a wagon full of PVC pipe, Plastic Pegboard, and hardware. Back to the shop and the pictured BOB was created, fitted with a Pasco (www.pasco.com) GLX data logger and a bunch of Sensors, including air and water temp, dissolved oxygen, pH, and conductivity (temp and conductivity calculates salinity). In 2008, The premise of BOB was adopted with open arms by Dr. Lundie Spence, director of COSEE- SE. Together we’ve hosted three workshops (the latest in Jacksonville Fl) introducing BOB as an effective program to introduce students to water quality by having them build and launch BOBs that contribute real data to real monitoring systems. It’s been adopted in several high schools, being deployed at the Smithsonian facility in Fort Pierce, Florida and expanding to community observation efforts up and down the east coast. Get in touch if you’d like additional information about BOB.